When hard-won earned media results of an excellent public relations campaign begin to show up, it’s not time to stop. That’s when the real work begins. A story’s initial appearance should be just the beginning of a productive placement life cycle. Read on for some easy ways to leverage initial exposure to an even wider audience. Maximize media placements with a few simple steps. The minute a profile appears on your CEO, or a brand spokesperson kills it on a live broadcast interview, it’s time for the social media team to get involved. This means posting links and images to all brand social accounts of course, but there are also opportunities to get more creative. 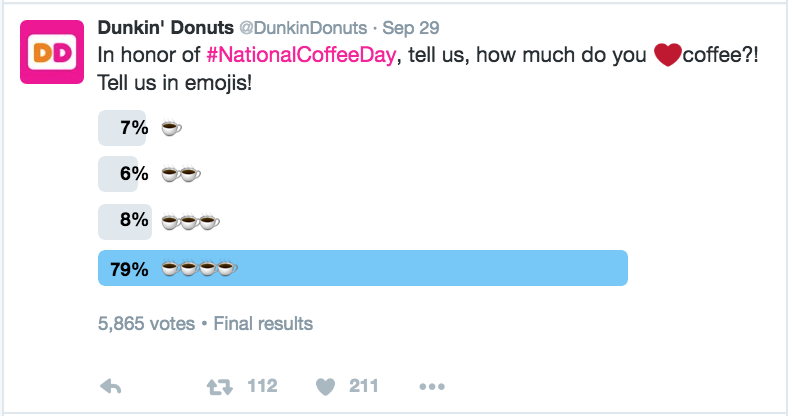 Perhaps crafting a Twitter poll with a question prompted by a seasonal piece such as this one from Dunkin Donuts or consider building a quick contest around a piece of earned content. Use the photos or video accompanying the piece for other posts, and give a social shout-out to the journalist or the outlet in question. Doing so can extend the life and the audience of the media coverage. Shout it out to prospects, customers, clients. This can be as simple as sending a link in a prospect email, a mention in a special offer blast or inclusion in a monthly newsletter. Also consider something more elaborate like creating a slick online piece with the help of a site like Coverage Book or producing a printed brochure with more than one piece of coverage. These work well if you have a captive audience like a panel discussion or speaking engagement where an audience can benefit by reading up on a speaker or company at the start of an event. If a story appears in a top outlet such as the New York Times or Wired, it’s also a good idea to tout the coverage in team signatures. Something like “Featured in…” with a link to the piece is always impressive. Standard practice also dictates that teams add all coverage to the press section of the company website. We are always surprised when a company doesn’t have an updated press page on its site. This is a must! Use the coverage…to get more coverage. Contrary to what some in PR believe, many journalists wait to cover a product or service until another (non-competing) outlet goes first. Therefore, when a great story appears, like this recent InStyle piece on digital wine site, Weekly Tasting, we use it to generate interest from other media. But there are caveats! Don’t use a lifestyle magazine interview to interest another lifestyle pub, as that will likely backfire. But do use it in a pitch to a morning talk show. We recommend building a brief dossier of solid placements in smaller outlets to catch a “bigger fish.” Trade pieces in discrete verticals can also be very effective as part of a pitch to a B2B publication with a wider audience. That edgy byline by the company CTO? The provocative round-up featuring a popular brand ‘s latest line extension? These and nearly every other media placement can live on with some simple tweaks. Take the byline and convert the information to a blog post. Use some of the points to create a white paper or take the byline in a different direction for a different audience. In a longer format, the piece becomes fodder for a talk at an upcoming conference. The round-up can be turned into an infographic to post on the company website or used as an idea for a holiday gift story. Use coverage to demonstrate results to leadership. As soon as the coverage appears, look for evidence of engagement or impact, like increases in website and blog visits, white paper or other content downloads and social media likes/shares to tell the story of the article’s performance. Always show, rather than “tell” the value of a public relations campaign. Coverage that can tie directly to company business goals provides a great demonstration of the value of PR. We like to thank the journalist in a personal note as well as on social media. Most reporters today are promoting their own social brands as well as their publication or employer, so a shout-out never hurts! But remember, you’re thanking them for a well-reported story, not a product plug. The bottom line is that most companies see press coverage as the end result of crafting a good story, pitching the right journalist and arranging an interview. But in reality, the coverage should be seen as just the beginning – a valuable piece of content that serves as a jumping off point to reaching your a wider audience.